AECOM is the managing contractor of the Pacific Horticultural and Agricultural Market Access Plus Program (PHAMA Plus) – an Australian Government funded aid program promoting primary industry exports from six Pacific countries (Fiji, PNG, Samoa, Solomon Islands, Tonga, and Vanuatu). For details on the program, please visit: www.phama.com.au. AECOM is seeking applications from suitably qualified personnel for the role of Inclusivity Officer based in Suva. The successful candidate will have a strong background engaging with the private sector on Gender Equality and Social Inclusion (youth, disability and remote communities) (GESI). The Inclusivity Officer will ensure that GESI is mainstreamed across PHAMA Plus, including ensuring GESI targets are met and the development of GESI-related tools. They will also contribute to PHAMA Plus research products and intervention planning. 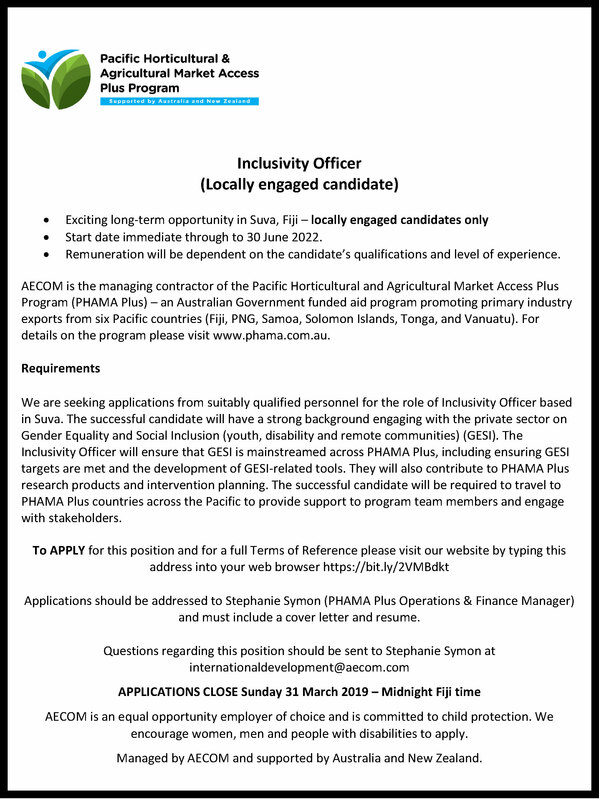 The successful candidate will be required to travel to PHAMA Plus countries across the Pacific to provide support to program team members and engage with stakeholders. Applications should be addressed to Stephanie Symon (PHAMA Plus Operations & Finance Manager) and must include a cover letter and resume.